With all the food filled holidays just around the corner, it’s time to start stocking up your arsenal of delicious, yet low calorie Weight Watchers Thanksgiving Recipes and Weight Watchers Christmas Recipes. And with Thanksgiving being the first in the lineup, we’ve got one tough holiday feast to conquer! And this delicious Thanksgiving Pumpkin Pie Recipe is a great dish to add to your lineup of low calorie Thanksgiving recipes! Creamy and delicious, this dessert recipe uses a light graham cracker crust instead of the traditional pie crust recipe. In my opinion, I think it actually tastes better and it helps us cut a lot of calories and Weight Watchers Points from this dish. No holiday would be complete without a slice of homemade pumpkin pie! This lighter version is just as decadent as you want it to be, with less fat and calories. In a food processor, process graham crackers into fine crumbs. In a small bowl, combine the crumbs, the melted butter, salt, and water, and mix with hands. Then transfer to an un-greased 9” pie pan, and distribute crust mixture evenly, pressing it against the pan with your hands. Put in the fridge and chill for 40 minutes. Then, bake about 8-10 minutes, or until the pie crust starts to turn that yummy golden brown. In a large bowl, whip egg whites into a soft peak, using an electric mixer. Fold in remaining ingredients. Beat the mixture until smooth, creamy and lump free, and pour into your pie shell. Bake for about 45-50 minutes, or until a knife inserted in the center comes out clean. I calculate 7 points per serving. 4 points for the filling. 3 points for the crust. The brown sugar in the filling and the crackers in the crust carry the biggest load. How do you calculate 3-4 pts? Is this recipe point value for the old weight watchers or points plus program? Jill, this recipe currently shows the old Points value. I don’t have the nutritional stats to be able to calculate the new Points Plus value yet. Why are there 2 egg whites listed in the crust recipe ingredients, but no reference to them in the directions? Are these the egg whites that go in the filling? If so, is there an additional egg in the filling as well? Thanks for catching my error! The egg whites are part of the filling…not the crust! And yes, there is an additional egg in the filling mixture. So so sorry for the confusion!! The recipe says ” fold in the ‘egg whites’ and beat until smooth and creamy’. That's no graham cracker crust in the photo! You are correct! 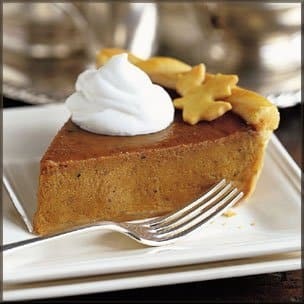 The photo is an image of a traditional pumpkin pie, and the purpose of the image is just for a point of reference. I'm not such a good photographer, so sometimes my pictures don't always come out so good and I have to use a stock image. But thanks for your input and sorry about the confusion! What are the little black specks in the pumpkin layer? I believe they are pieces of the spices in the pumpkin pie spice mix. Most likely nutmeg. I don't know the exact calorie count on this, but based on it having a weight watchers points value of 3, it should be somewhere between 100-200 calories per slice. Go back to the recipe and click on ‘NUTRITION: and it will give all information.